Customer service is seen as a cost center by many companies. Call times are meticulously tracked. However, customer service is really a huge privilege for the company. Right now, there are customers alienated by your brand who you don’t know about. But the customers who actually contact your company are giving it a second chance to keep them as a customer, so it’s important to understand how likely customers are to let your brand fix its mistakes. Read on to see the data, along with analysis and commentary from MarketingSherpa; Eugenia Buggs, VP, Global Marketing, Identity and Digital Protection Services Global Unit, Generali Global Assistance; and Joseph Grusman, Sr. Director of Marketing, Zappos. In the MarketingSherpa Customer Satisfaction Research Study of 2,400 consumers who were sampled to reflect a close match to the U.S. population's demographics, we asked half of consumers to tell us about a company they were satisfied with, and the other half to tell us about a company they were unsatisfied with. We then asked them a series of questions to better understand why customers were satisfied and unsatisfied and how it affected their behavior. 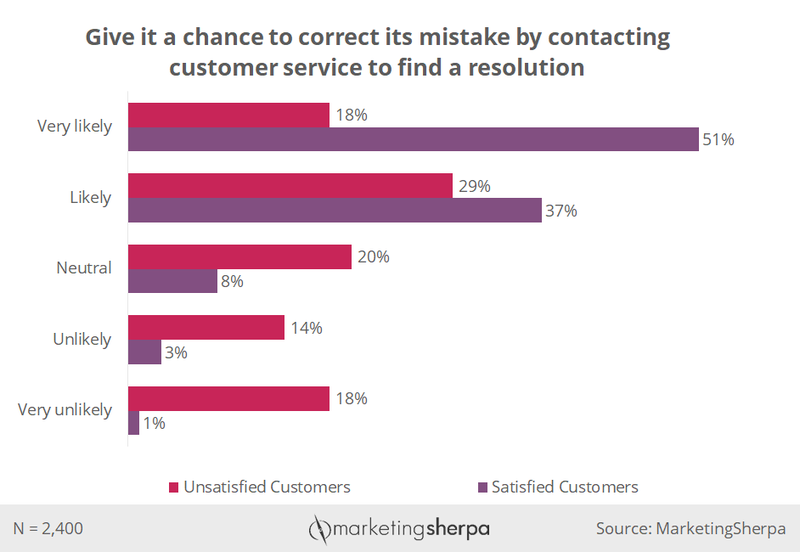 This week, we look at how likely consumers were to Give it a chance to correct its mistake by contacting customer service to find a resolution when asked ... When [company name] makes a mistake and fails to meet your expectations, how likely are you to do the following? Satisfied customers are much more likely to give companies a chance to fix a mistake by contacting customer service than unsatisfied customers. Half (51%) of satisfied customers said they were very likely to contact customer service, and 37% of satisfied customers were likely to contact customer service. Just 18% of unsatisfied customers were very likely to contact customer service to find a resolution, and 29% of unsatisfied customers were likely. The majority of unsatisfied customers (52%) were neutral, unlikely, or very unlikely to contact customer service. There is a common fallacy that views customer service as a cost sink. And customers who reach out to customer service as unsatisfied customers. However, as you can see from the data, satisfied customers are much more likely to contact customer service. This is likely because many unsatisfied customers have already given up on the company and have moved on. So there’s a real risk here for marketers who don’t own customer service in their organization. You should at least have a good partner running customer service who your marketing team can proactively collaborate with. “Primarily, this data emphasizes the importance of marketing departments working very closely with their customer service and operations teams,” said Eugenia Buggs, VP, Global Marketing, Identity and Digital Protection Services Global Unit, Generali Global Assistance. As we all know, it’s cheaper to keep a customer than to get a new customer. Word-of-mouth is powerful. And it’s not only stadium namings and emotional TV ads that builds a brand — every customer touchpoint shapes that brand perception. 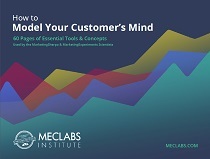 Before we integrated our customer service and marketing teams at MarketingSherpa and the MECLABS Institute, we would let our customer service know when a major campaign was about to launch and prep them with what they needed to help our customers. For example, when the free MarketingSherpa Ecommerce Benchmark Study launched, it was free, but invariably, a few customers would have an issue with the download. By prepping customer service beforehand, they were able to quickly address any customer issues. The same holds true for all of your marketing campaigns. Not only working with customer service to proactively make sure it can address any issues, but also working throughout your organization to make sure your marketing initiatives are more likely to give customers what they need, resulting in less questions and complaints. Joseph Grusman gave me a nice example when I showed him the chart’s data. “The data should not (I truly hope) be news to people. But I love the aspect of the relationship with the customer, the motivations behind the act,” said Joseph Grusman, Sr. Director of Marketing, Zappos. Buggs had a nice example of proactivity at Generali. “One data point I found particularly interesting is that over a quarter (32%) of unsatisfied customers are not likely to reach out to a company when they have a concern, nor should we expect them to. If a customer has had a poor experience, they likely already feel as if their time was in some way wasted, and it’s not fair to assume that the customer will want to devote additional time to giving your business a second chance,” Buggs said. This assistance service and travel insurance company also has a process in place that quickly addresses any negative feedback, whether it’s via the survey, an email or social media. It involves continuous two-way communication between the company and the customer, not just a one-way message speaking at the customer. “This process involves and is tracked by both our customer service AND marketing staff,” Buggs said. It includes phone, online, email and postal mail outreach to ensure that Generali is making contact in the manner that is best for the customer, not what’s most convenient or cost-effective for the company. The postal mail communication even includes direct contact information for the VP of Service Delivery, which is sent regardless of whether the situation has already been resolved by a manager or supervisor. This is important to show customers that the company is doing more than solve their immediate issue but is also solving the root problem. “Consider how many times you speak to a supervisor and they give you a credit, a complimentary service or anything else to make up for your negative experience with the company. When you end that engagement, however, you have no real sense that the same situation won’t happen to you again the next time you engage with that company or to another customer 10 minutes later. On the other hand, knowing that an executive within an organization is aware of your issue, actually wants to talk to you about it and plans to take action based on your conversation is a completely different level of service, and should leave customers with a much higher degree of satisfaction with your brand,” Buggs said. Customer service agents certainly take their lumps on the company’s behalf, so you could perhaps motivate them by showing how their front-line work with customers is creating a better company and customer experience as a direct result of their cataloguing customer complaints and ensuring the right people in the organization know about these complaints to fix that root cause. Make sure your customer service reps are empowered and trained to actually communicate like humans, not just automatons reading from a script. “Most people are blown away when they get a genuine apology from a company, but it’s important to note that ‘genuine’ is the key word here — anyone can simply say, ‘I’m sorry about the inconvenience.’ That’s trite and often scripted, and it leaves a customer even more annoyed than before; just saying ‘sorry’ does NOT constitute a customer-first approach,” Buggs said. “A genuine apology may not even include the words ‘I’m sorry’ (though it likely should) because customers really want you to acknowledge the issue, promptly rectify it and explain why it won’t happen again; THAT demonstrates that you are customer-first. All of this is also particularly important in ensuring that the 88% of satisfied customers [who would likely contact customer service] stay satisfied customers, despite your business’ mistake,” she said. The focus of this week’s chart is how likely customers are to contact customer service when things go wrong. But we would be remiss not to mention that things also go right, of course. Generali’s marketing and customer service teams also follow up with customers who share their positive experiences. The teams value the customer’s time and that the customer took a moment during their busy day to send an email, leave a message on the positive feedback line or write a handwritten letter (according to Buggs, yes, this does happen). The customer service team expresses gratitude and lets the customer know that Generali plans to duplicate, or even improve upon, the experience each time the customer engages with it. This is also an opportunity to request public use of these statements for marketing purposes. “Nothing epitomizes ‘customer-first’ more to me than celebrating and publicizing the positive experience of the customer themselves,” Buggs said. Lastly, we’ve discussed in this article how satisfied customers are much more likely to contact customer service than unsatisfied customers. So, beyond how your customer service works, it’s important to create more satisfied customers who will give your company that extra chance. And if you’ve read MarketingSherpa for any length of time, you know one way to create more satisfied customers is with customer-first marketing. “Customer-first marketing, in its simplest form, can be boiled down to the golden rule — treat people like you would like to be treated. We are all customers of some business at some point, so it’s important to always think of yourself as a customer first, regardless of your profession or job title within an organization. If a commitment to the customer-first approach becomes the foundation of your business, these same core values will permeate and define your marketing efforts,” Buggs concluded. Customer-first Marketing Chart: Does customer-centric marketing fall short of satisfying the customer?